Ben Spanjers says he didn’t have time to get nervous when he bagged this extraordinary Minnesota monster buck with archery equipment on October 3. Spanjers, while viewing his trail cam photos, was surprised to find this big brute of a whitetail on film when he stragetically placed the cameras to overlook some large scrape areas. Unlike many big bucks, this monster whitetail was photographed during the daylight hours, proving to Spanjers that he indeed had a very good chance at bagging the deer. As Spanjers began to decypher the bucks patterns and movements he narrowed his options and began the hunt. Spanjers wouldn’t have to wait long as his homework paid off in a big way when the buck appeared 70 yards out heading straight for him. As the buck approached he presented a clear shot at a mere 20 feet and Spanjers took advantage of the instance bagging what might very well become the largest whitetail buck to be bagged this year in the entire country. The huge buck dressed out at 265 pounds with a live weight of 310. The buck had 23 scoreable points with a massive 24 inch inside spread. it scored 230 5/8 Pope and Young and is expected to make the Boone and Crockett archery division. 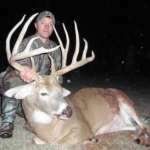 Spanjers is an avid bowhunter and plans to have this spectacular buck preserved with a full body mount. With the possibility of this buck being the largest ever taken with a bow in Minnesota there has been a lot of talk regarding endorsements. In response Spanjers simply responds that he hasn’t heard anything as of yet.